I've been working the idea for this recipe over and over in my head for at least a year now. Pates are often enriched with foie gras, so why not something a bit more simple, like a fresh sausage? I looked it up, but most recipes seemed over the top and full of black truffles and sweetbreads, negating the effect of making a sausage that really showcase foie gras. So moving into a new house gave me the excuse to bring the recipe in my head to life. It was actually really easy. Foie Gras is very easy to work with, just treat it like a big slab of butter. If you want to cut it up into cubes, keep it cold. If you want to mix it around and keep the cubes shape, keep it cold. If it gets warm, its going to start smearing. Keep it cold and its clear sailing. 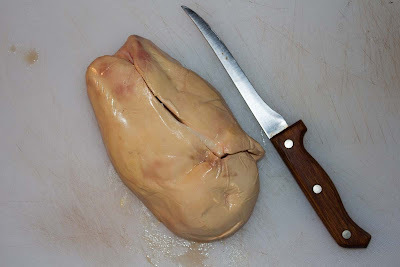 I cut the odd-shaped ends of this lobe of foie gras from Hudson Valley, saving the large, center cuts for a later use. The base of the sausage was 2.15 lbs of organic chicken thighs, with a little over .75 lb of foie gras cubes (about 1/4"x1/4", like cubes of backfat in a cured salami). I ground the thighs up with their skin, mixed it with my hands till the meat was sticky and very tacky (this produces myosin protein, which is like gluten in bread and keeps the sausage filling holding together). The meat was seasoned with salt, white wine, white pepper, mace, and ginger, then packed into hog casings. To cook the sausage, I poached it at 160 F for about an hour in a mixture of salted water and vignoles white wine. As you can see in the less-than-flatter photos, the sausage released a good amount of golden foie fat during the cooking. I thought the gentle cooking method would be best, but this oil slick on top made me worry the sausage would be dry. Thankfully it was just the opposite. The sausage came out great! I made this dish for my parents and it was a big hit It's funny, I've been churning this recipe around in my head for so long, it seemed very easy and straight forward once I sat down to make it. I even mapped out the accompaniments in my head. I like pairing foie gras with earthy root vegetables (beets are a favorite), and I thought I could play off the "bangers and mash" idea with a carrot puree as a bed for the sausage. To make the carrot puree light, I mixed it with creme fraiche to give it a bit of a tart, clean flavor. Ginger, white pepper, and celery seed rounded out the seasoning. 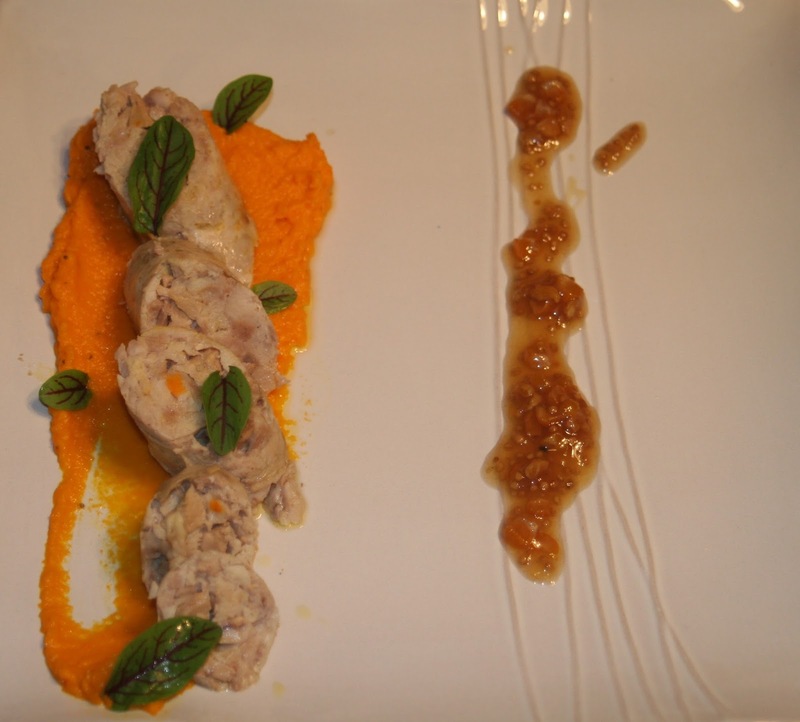 As a condiment, I added my corn mostarda, which provided a nice, sharp flavor to cut the richness of the foie gras. Plus, the corn mostarda's sweetness was a nice foil for the naturally sweet carrots. My mother gave me the idea for the finishing touch: "Get some green on there to break up all the tans and oranges." So I sprinkled a few leaves of bloody sorrel I had growing in a pot. As an added benefit, the sorrel's tart flavor played off the sharp mustard flavor. I'm really happy with this recipe. Now that I know it works, I need to make more next time. I cannot speak to the creation of this triumvirate of dishes but I can testify as to the delivery. It was mouthwateringly fabulous. Starting with what might be called chicken sausage fois gras, accompanied by the carrot & creme fraiche puree, and Nick's corn mostarda (somewhat like a chutney relish). Wow! His French-American grandfather, who loved to cook and to eat, would be impressed with his grandson's culinary skills.